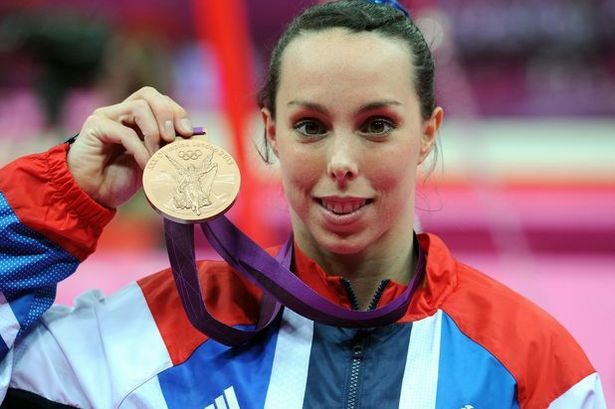 Olympic gymnast Beth Tweddle is used performing under pressure, having spent most of her life competing at the highest level in sport. But even she admits she’s feeling the heat as Aintree Ladies Day gets nearer, especially as she’s only just ditched crutches! Beth, who turns 30 just before the Crabbie’s Grand National, has just undergone surgery on both her feet which has left her at a disadvantage when it comes to races preparation. As a Ladies Day ambassador, she will be taking part in the first Grand Women’s Summit being held on the Friday of the Aintree festival. The summit will celebrate women in horseracing, sport and business, and will give guests a chance to listen to panellists discussing a range of topics including improving the gender balance and how to inspire young girls before a Q&A. Having competed at three Olympic Games - Athens 2004, Beijing 2008 and London 2012 - Beth has become a passionate advocate of gymnastics, and sport in general, since retiring. As a director of Total Gymnastics which she set up with fellow Olympian, Liverpool swimmer Steve Parry, she aims to give as many children as possible the opportunity to take up gymnastics in schools, leisure centres and clubs. “I tend to do more of the mentoring/coaching side of things,” she says. “My heart is still very much with gymnastics and working with children and hopefully inspiring a younger generation. “A lot of what I do is about going out and talking to people about women in sport and young girls, and giving them a role model, but also getting young boys involved in gymnastics. “I think with any sport there’s always a thing of ‘can we get more women involved and how?’ but I was lucky with gymnastics because it’s one of the few sports where people actually want to see women competing more than men. Recognised as Britain’s greatest ever female gymnast, Beth is an Olympic bronze medallist, three time World Champion, a six-time European Champion, Commonwealth Champion and seven-times consecutive National Champion. But after two decades of competition, she decided it was time to give her body a rest. “I’ll always miss representing my country,” she reflects, “but you’ve got to appreciate that you’re done it for so long and just remember the times you did have. “I loved competing, that’s what I lived for, but now I love watching and obviously British gymnastics is in such a healthy state at the minute so it’s quite nice for me to enjoy their success. Her own achievements, alongside those of male Olympic medal winning gymnast Louis Smith, have helped to raise the profile of the sport. Not surprisingly for someone who excels at everything she does, Beth won Dancing on Ice with skating partner Daniel Whiston in 2013. Beth took the decision to have both feet operated on last month, repairing some of the damage done by sport over the years. “It was just easier to have them both done at once,” she explains. “It was basically wear and tear, I just needed them Hoovered, to use the technical term! “I had bits and pieces taken out of them, just little chips rather than anything major, but I was on crutches and I couldn’t drive, run or jump. I’ve just got rid of my crutches so I can walk again without them but not much else and it’s killing me.